Before she'd get a chance to enjoy her own lunch Tuesday, Emilie Geissinger had a host of tasks to complete. 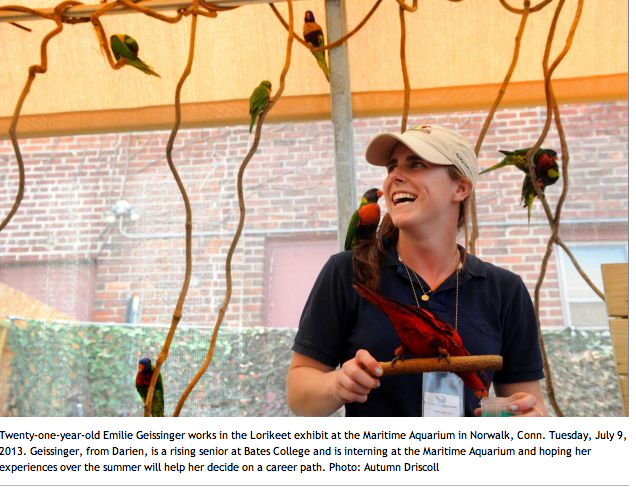 They started in the food preparation room of Norwalk's Maritime Aquarium. There, the 700 herring and capelin fish she helped sort and weigh were bound for the mouths of otters and seals. Then, she headed outside to a giant bird cage stretching along the banks of the Norwalk River. Inside, she pulled a baseball cap low over her head, found a spot near some low-hanging branches and scooped up a plastic tray of nectar. Soon, a rainbow-colored lorikeet -- a small parrot, native to the South Pacific, but numbering more than 50 in this particular cage -- landed on her shoulder, eying the sugary drink. Then came a second. Then came a third, plopping straight on her head.